"Inspired by the Peruvian rotisserie chicken, this recipe combines 'pollo a la brasa' seasoning with the beer can cooking technique. The goal is to produce a tasty chicken with a crispy exterior and juicy interior. Serve it with fries and the salad of your choice." Dissolve 1 1/2 teaspoons salt in water in a large bowl and stir in lime juice. Soak chicken in the mixture for 10 minutes; rinse and pat chicken dry with paper towels. Pierce the chicken all over with a fork to make many tiny holes. Stir vinegar, cumin, olive oil, oregano, rosemary, paprika, garlic powder, 1 teaspoon salt, soy sauce, and black pepper in a small bowl; mix in enough beer to form a paste, about 2 tablespoons. Retain remaining beer in the can. Rub spice paste all over the chicken, beneath the skin, and inside cavity; refrigerate for 1 hour. Preheat grill for medium heat; a grill thermometer should read 350 degrees F (175 degrees C) with the lid closed. 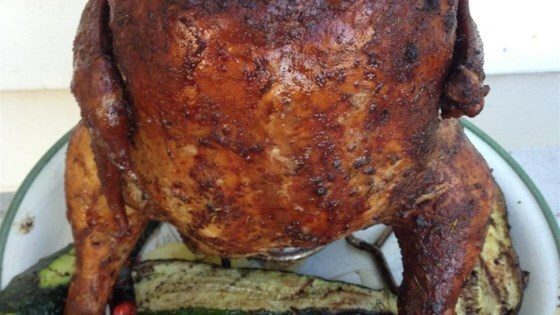 Sit the chicken upright on the partially-filled can of beer and extend drumsticks to the grill surface to form a tripod shape to hold up the chicken. Grill chicken with the lid closed until the skin is brown and crisp and an instant-read meat thermometer inserted into the thickest part of a breast, not touching bone, reads 170 degrees F (75 degrees C), about 1 1/2 hours. Let the chicken rest for 5 minutes before slicing. I tried this with the addition of hickory chips to give it an extra savory flavor. Excellent look and flavor. The skin was crispy and the meat moist. We loved this recipe. It was extremely flavorful - great mix of spices. The next time I make it, I will leave it in the brine longer than 15 minutes to make it even juicier. Thanks!